Jacqueline Audry usually approached her text with great reverence, but here she was revisionist to the point of destruction. Quite why screenwriter Pierre Laroche felt it necessary to emasculate Jean-Paul Sartre's existential masterpiece remains a mystery. Yet it's plain to see what a disservice his decision to add extra characters and incorporate other-worldly flashbacks does to the relentless intensity of the original drama, in which a recently deceased trio discover the bitter truth that hell is other people. 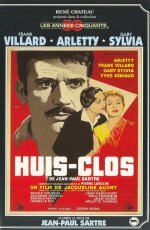 However, Arletty imparts some much-needed class as the ageing lesbian desperately trying to dissuade flirty Gaby Sylvia from hitting on homosexual Frank Villard.